Made of domestic wood cut in northern Michigan and Wisconsin, this basswood is valued for its economy, workability, and finishing qualities. Because of its close, homogeneous grain structure, it is ideal for a wide variety of hobby, craft, and miniature projects. 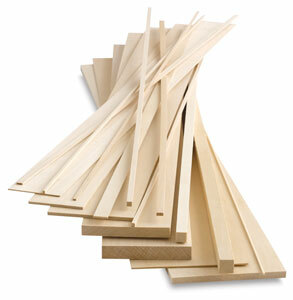 Thin pieces of basswood can be cut with a hobby knife, while thicker pieces require a saw for cutting. Basswood can be stained or painted to represent any wood type.